Customizability and personalization are among the top reasons why people choose Android over other platforms. Among the wide range of smartphone user types include purists who prefer to have the most stock Android experience possible, and then there are users who want to have the most customizability. Two smartphones address these two types of users quite adequately: the Google Nexus 5 and the OnePlus One. The Nexus series is about as stock Android as you can get, and the vanilla experience is further improved by the fact the Nexus line gets the first dibs on Android updates before everyone else does. In addition, because Nexus devices are supposedly free of bloatware, users can enjoy their smartphone or tablet without being bogged down by unwanted apps and services. Meanwhile, OnePlus One has been touted as a flagship-killer because of its top-grade specs offered at a reasonable price. The One’s launch was quite hyped, and even with a few mix-ups when it first shipped pre-orders, reception has been quite positive. OnePlus also comes shipped with CyanogenMod, which is the most popular third-party ROM, offering high levels of customizability and great community support. Today, we compare the Google Nexus 5 and the OnePlus One, two venerable Android devices that offer decent performance at reasonable prices. The two devices normally cost $350 (off-contract), which could make deciding between the two handsets a challenge. However, both the Google Nexus 5 and OnePlus One have their strengths and disadvantages, and the choice really up to the user. We hope that our comparison will help you decide. The Nexus 5 offers a minimalistic design with its unique character, including a soft-touch back and its “Nexus” logo embossed sideways. The phone offers a comfortable button layout, and at 5-inches diagonal, it’s not that difficult to operate one-handed, something the OnePlus One has a bit harder time with, due to its larger form factor. Meanwhile, the OnePlus One is a decidedly bigger device that offers more visual flair, especially with the silver wrap-around lining on the bezel. The back panel has a soft sandpaper-type surface, which provides a good amount of grip. Notable differences include the presence of capacitive buttons (which can be activated or deactivated depending on user preference), and the replaceable back panel. 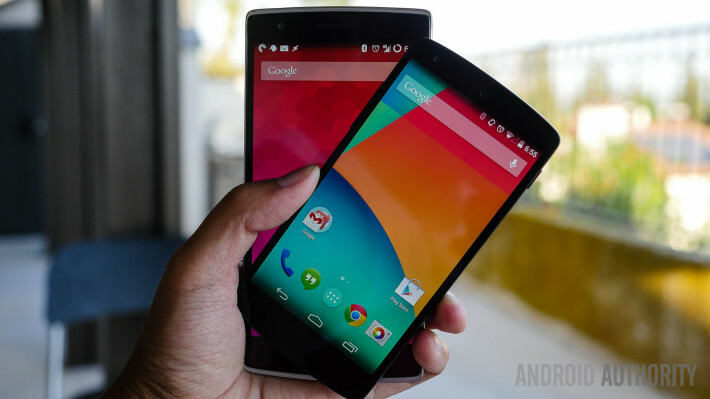 Between the two, the Nexus 5 is easier to handle due to its size. At 5.5 inches, the OnePlus One is already bordering on phablet territory and might require two-handed operation in many instances. This could be a challenge if you prefer a handy device, although the bigger screen size does have its advantages. Still, in my experience I could comfortably use the OnePlus One single-handed in most cases. The Nexus 5 comes with a now-common in-plane switching (IPS) panel, sized at 5-inches, while the OnePlus One uses a 5.5-inch low-temperature polysilicon (LTPS) display. Both afford the user a crisp 1080p resolution display. In terms of display quality, both devices are on par with each other at first glance, with adequate viewing angles and accurate color reproduction. However, the difference in display size means that each device may be targeted at different user types altogether. With a bigger screen and the same resolution, the One’s display has a lower pixel density at 401 pixels-per-inch (PPI), while the Nexus 5 has a respectable 443 PPI, which means the display is crisper and smoother on the Nexus 5. The bigger screen size on the One offers a more comfortable multimedia experience, however, which means a more enjoyable experience watching movies, playing games or even simply reading text on the bigger screen. Still, a 5-inch screen should be good enough for most users, as this size is still a good balance between usability and portability for most people. Those with bigger hands (and fingers) might prefer the One’s bigger screen, however. Being an older device, we can expect the Nexus 5 to lose out a bit in terms of performance, powered by a more dated Snapdragon 800, compared to the OnePlus One’s Snapdragon 801. Aside from its newer processor, the One also has 1GB more RAM than the Nexus 5, as well as a 0.2 GHz advantage in clock speed. Still, for most users, the difference in specifications is negligible, as both devices perform quite well in real-world scenarios. You should be able to get adequate performance from either device, and the spec difference may only be noticeable if you’re doing processor- and memory-intensive tasks continuously. It’s perhaps in the underlying software and user interface that users might feel drawn to one device as opposed to the other. Again, the Nexus 5 is as stock as Android can get, offering the vanilla interface that Google intended. You also get the promise of timely updates throughout the lifetime of the device (now at 4.4.4 KitKat). On the other hand, the OnePlus One runs a custom ROM. CyanogenMod 11S is a build of CM11 designed specifically for this device, which means the software is meant to take full advantage of the device’s capabilities. Both the CM team and the community revolving around it are diligently working toward ensuring the best performance and compatibility, adding in a host of new features and customizability options that power users often look for. For example, there’s a great gallery app, custom wake-up gestures, as well as the native ability to record your screen. If space and capacity are an issue, the OnePlus one also trumps the Nexus 5, at least at the same price point. 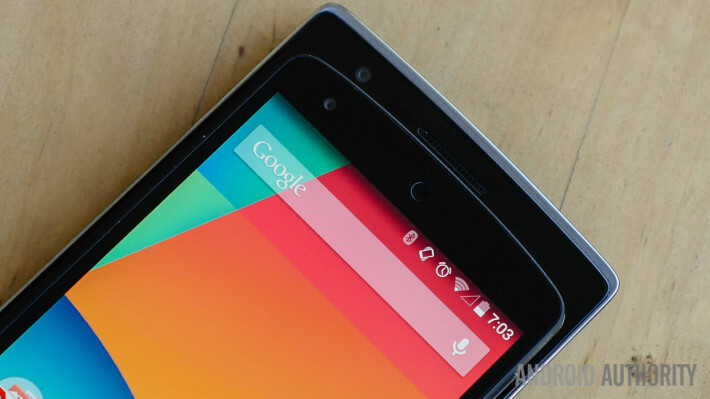 At $350, you get the 64GB OnePlus One variant, but only the 16GB variant for the Nexus 5. Remember that neither device provides microSD expansion capability, so local storage could be a limitation. Both devices should provide adequate audio quality for calls. However, neither one offers stereo output on their loudspeakers. The OnePlus One has an advantage here, as it offers dual-mono speakers at the bottom grills, compared to the single-speaker output on the Nexus 5. Both devices offer adequate battery life, although the Nexus 5 lasts longer in our tests, even if the OnePlus One has a nominally bigger capacity than the Nexus 5 (3100 vs 2300 mAh). Neither device got us more than a day’s use, however. So if you’re planning to stay out for extended times, better bring a car charger, wall wart or powerbank, as heavy use will get you just under a day’s worth of battery power. The Nexus 5’s 8-megapixel shooter is a decent shooter in its own right, especially after a software update that addressed some performance glitches. The device comes shipped with the stock Google camera, which offers a straightforward but plain interface, offering basic control over image capture, and modes like HDR, lens blur, video, panorama and photosphere. You can check out one of our Nexus 5 camera comparisons for a better view of how the stock camera performs. The OnePlus One comes shipped with a better camera and more feature-packed software. The 13-megapixel shooter does the job quite well, capturing clear and crisp images. The interface is also decidedly more intuitive, allowing users to change modes simply by swiping across the screen. Dig deeper into the options and you can get better control over your smartphone photography. You can get better image quality from the One not only from the higher-resolution lens, but also due to the greater number of in-app options. We also have a OnePlus One camera shootout, in which we test the One’s camera in various scenarios. In my opinion, the vanilla Android experience on the Nexus 5 provides an excellent canvas for all sorts of customizations and features, and users can customize and tweak through apps and even add-on modules (like Xposed, for example). However, in terms of customizations and tweaks, there’s no team or company more recognizable than CyanogenMod, and their Android implementation in the OnePlus One really shines. CM11 takes full advantage of KitKat, and it is in the software that the One comes at an advantage — simply because it can do more out of the box, and can also provide deeper customizability, so that you can set-up the devices as you please. Also, both devices perform on the same level, although the size could be a deciding factor, especially if ergonomics and ease-of-use are important. The Nexus 5 is more handy and pocketable, although the OnePlus One does offer a better multimedia and smartphone photography experience. One big concern might be the availability of the OnePlus One in most mobile markets — it is not yet as widely available as the Nexus 5, which has been selling for more than half a year now. If you’re out for a smartphone purchase anytime soon, either option is great, depending on your needs and preferences. Of course, with the Nexus 6 and other upcoming flagship devices just around the corner, you could also wait a while for these devices to launch or for older devices to get a price drop. Display 4.96-inch IPS LCD, Full HD (1920 x 1080), 444 ppi 5.5-inch LTPS IPS with TOL display, 1080p (1920 x 1080), 401 ppi. So, which one takes your pick? OnePlus One, or the trustworthy (and highly available) Nexus 5. Let us know your thoughts down below.